Wow. The weekend is almost over. Busy weekends go by so quickly, don't they? We spent the day with some of my cousins and an Aunt. Several were visiting from out of state. We had such a great time! Anyway, I've got a card to share. I saw the color inspiration over at The Shabby Tea Room - week #120 "soft & sweet". Such a pretty color combo that I had to find the time to play along. Here's the inspiration photo. Edited to add: Ooops, I'm too late to enter the challenge! I used a lot of layers and textures (and quite a few die-cuts) on this card. I got that cute spool button recently and the soft aqua color fit right into this color scheme. And the little felt circle with the heart cut out? It was a left-over from another project. So glad I saved it. Well, I've got to go, so I'll list my supplies below. I'll be placing this card in my Etsy shop. Super sweet! 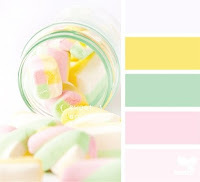 Love those pastels!